It’s week four of Food Network’s season-long garden party, Summer Fest 2011 and here I am with another recipe to take part in the fest! 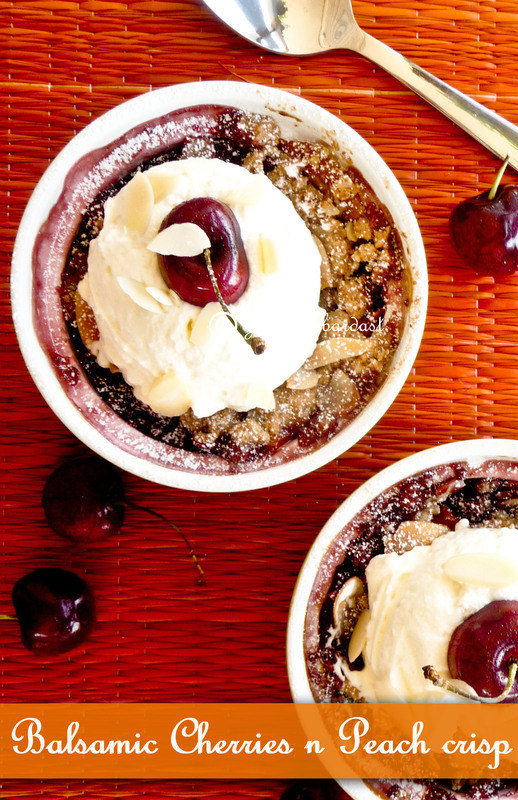 This time the main ingredient is ch..ch..ch..ch..”Cherry”, and to celebrate the summer fest, I made this beautiful, scrumptious “Balsamic cherries n peach crisp”. So why it is called “Crisp”? hmmm how can I explain? Let me give it a try! Do you like a flaky crust of pie? It is kind of the same but the ingredients are bit different (or should I say healthier :)) and so is the layer. You do not need to roll the dough, you just need to mix the ingredients and spread it over the fruits and let it bake in the oven for 35-40 minutes. And also Crisp is only covered from the top and pie is nicely covered from the top and bottom. Easy hmm? This dessert is very easy to make and healthy since it has fresh fruits and less butter in it. I make fruit crisps many times and it is one of my favorite dessert. I have tried balsamic vinegar with strawberries and peaches. Both the experiments were successful. I even make peaches and blueberry crisp so thought to substitute blueberries with cherries and to give it a nice tangy twist I added some balsamic vinegar. And oh boy!! It’s really heavenly. Warm fruits covered in a crispy layer of oatmeal and on the top of that a bit of mascarpone cream in every bite…hmmm.. I can still feel the taste!! It really is delicious. I hope I will be able save some for V :). You know what you definitely need to try this one. It’s worth the effort. 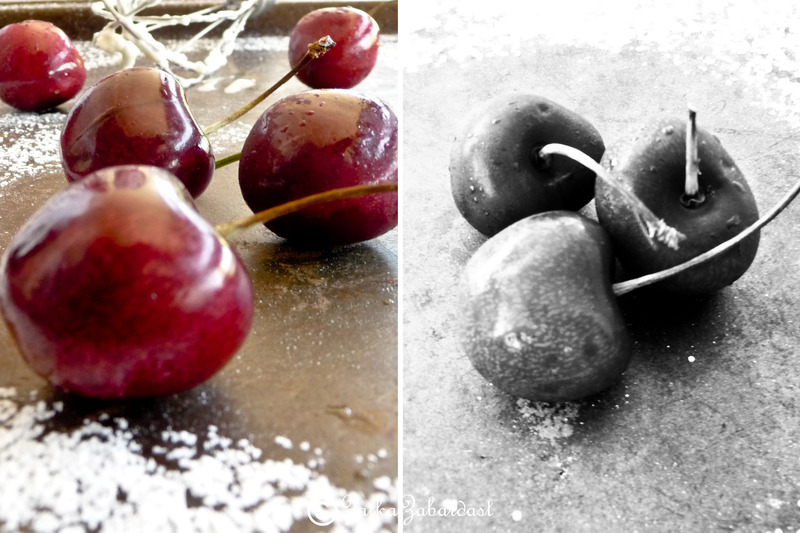 Talking about cherries, I never liked cherries in my entire life (I am talking as if I am into my 80’s)..hahah. No but really I never enjoyed the taste of preserved dark red glossy cherries we get on the cake or ice-cream. YUKK it is! So I was kindaa afraid to try the fresh ones because I was kind of expecting the same taste. But guess what I absolutely loved it. Now I do not forget to buy fresh cherries every time I go to the grocery store. I just love these tiny tangy, sweet cherries! This summer it has taken place of grapes in my refrigerator. 🙂 I wish summer stays here for longer time so I can enjoy all my summer fruits/veggies for longer time and not the heat. 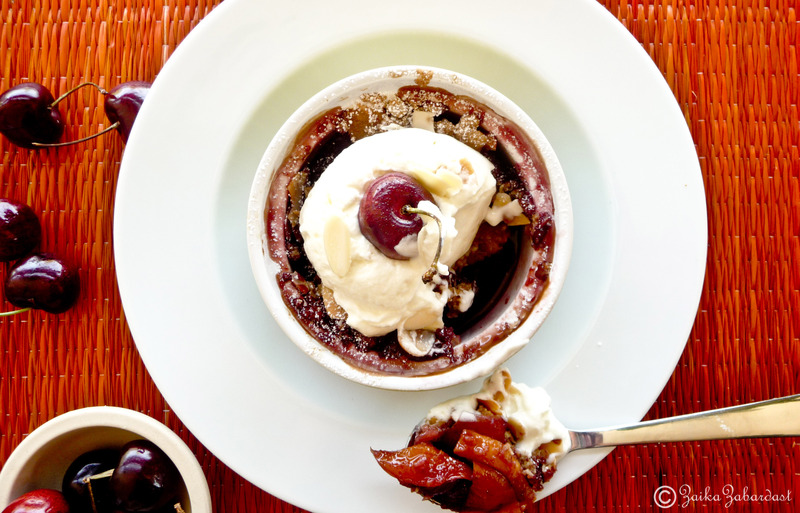 So here you go with the easy recipe of “Balsamic cherries n peach crisp”! Enjoy! 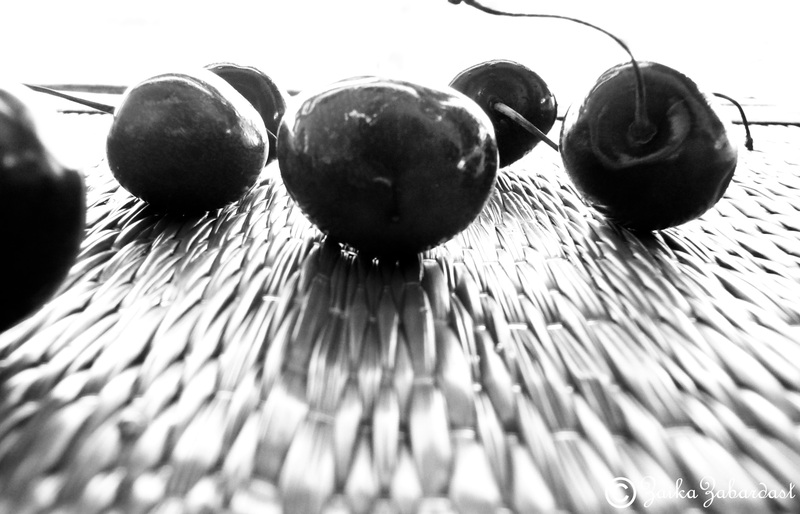 In a small saucepan, stir together the cherries, sugar and balsamic vinegar, and place over a medium heat. Bring to a boil and continue to cook for 5 minutes, stirring occasionally. 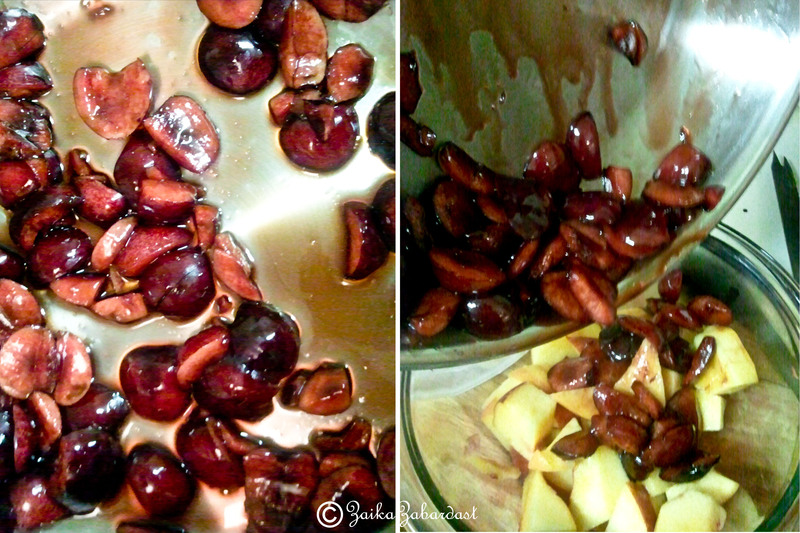 In a medium bowl toss the warm cherries and syrup with the sliced peaches. Divide fruits equally into ramekins and cover with the layer of crust (Recipe below). Bake it for about 35-40 minutes or until the top is browned and crisp and the juices are bubbly. Serve with a dollop of Mascarpone cream (Recipe follows) and garnish with some sliced almonds and cherries. Once done follow with the steps mentioned above. Place the sugar into the mixing bowl and add the whipping cream. Whisk just until the cream reaches stiff peaks. Add Mascarpone cheese and mix for 1 or 2 times. Just mix it do not beat it. Put a big scoop of Mascarpone cream on the top of your Balsamic cherries n peach crisp and garnish with some sliced almonds, cherries and serve. Serve warm or at room temperature. this looks just lovely + oh-so-summery. nicely done! I love that crust recipe. Got to try this one before the cherry season is over. Very very delicious … I wish I could have had it when it was freshly baked. Good job with the photography as well … keep it up and make it once more pls….. 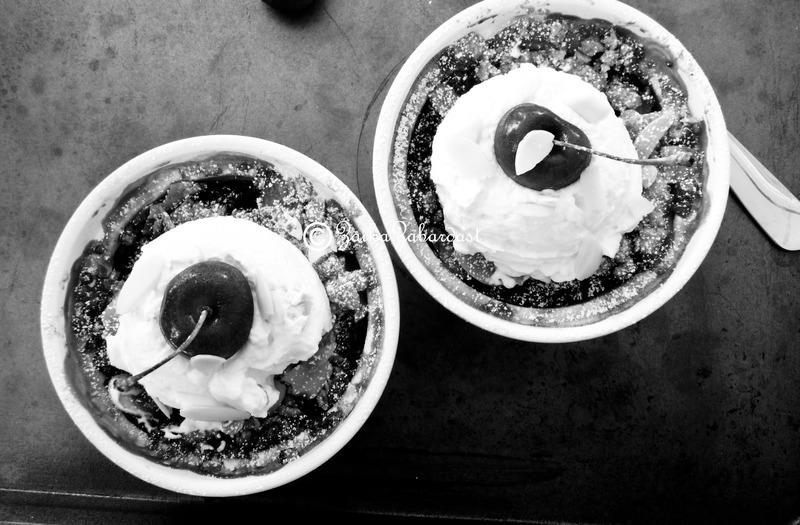 Awesome clicks and looks yummooo!!! Gorgeous photos and it looks so delicious! I can’t believe you thought you didn’t like cherries! I admit, the overly sweet, preserved ones could turn some people off, but I am SO glad you decided to try them. 🙂 I love love love cherries myself, I can’t get enough of them! Love this recipe! Ohhhh my! I’m loving everything about this! Great flavors!! Thank you Mary! I am glad you liked the recipe and I am very much glad to find you as well. Welcome to Zaikazabardast. Grishma, so happy to know about you. I just added you to my blog roll. See you in August. I love this beautiful cherry recipe. Your photography is lovely and I know this will be delicious when I try it. Thank you very much Teressa! I m glad you liked it. Really looking forward to see you in OCT at FoodBlogForum 🙂 Also added your blog in Blogroll. Cherries are my fav especially in baking! Dessert looks yumm!